Ok, sounds like a silly question. This coming weekend, my granddaughter and I are going to puts some Christmas lights on the coupe. I'm taking the battery out of the Trans Am and putting it in the trunk of the coupe and then using an inverter to power the lights. I am hesitant to use tape to attach the lights to the body but really can't think of an option otherwise. Am I missing something or is tape what you guys use? I used colored duct tape (red & black), zip-ties and bailing wire. This was before I restored the body and some of the paint did pull off. Since the police won't let me drive with Christmas lights I do not decorate the car anymore. 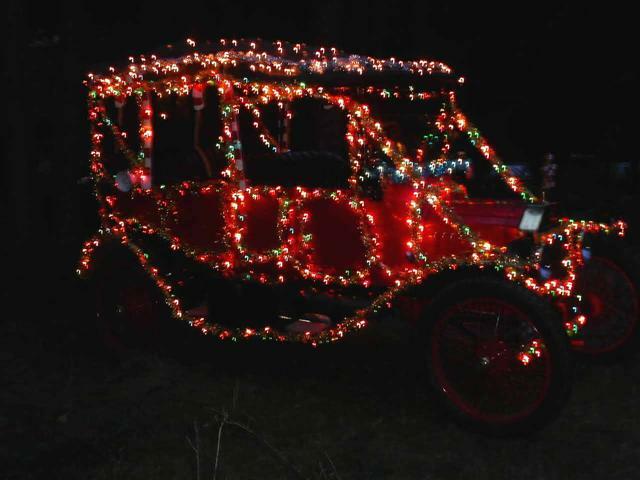 I had over 2000 lights and a 1 KW generator on the running board. If I ever do it again I would use a battery and inverter and LED lights. Love the look there Bob! I hadn't thought about the cops and all. Twenty years ago, I had a 69 Firebird that I had put those blinking "Knight Rider" lights in behind the grill. I was stopped on a few occassions and made to turn them off. I think it was bacause they were red though. Maybe I should go with all green and white...hmmm.. I do like the idea of the magnets, Craig but just don't think that's too workable right now and at this late date. But the big question is...why the heck am I up so dang late??? �IF� it is a one time for the parade only trip � you can do a lot of things for a slow parade that will not work well for normal driving speeds. I.e. the paper flowers on the floats will blow off at highway speeds but look nice at the slow walk of the parade. Depending on how tight your doors fit and how many strands you want to put on the car -- you might be able to open your coupe door and drape the wires over the top hinge -- run them to the cross bar for the headlights etc. Plan �B� � colder but could also work � open the front windshield and run the wires around the bracket that holds the windshield open. I�m 60 percent sure that in the wood and C-clamp section of Lowes I saw some clamps that were plastic coated. Those could probably be clamped to your rain gutters, fenders, etc. to secure the wires. I would not recommend driving much with the wires as I believe they will tend to rub the paint if the car is driven normal speeds. You could also consider the �old time Christmas tree in the trunk� bringing it home decoration. Fairly easy to do � and many folks like it a lot. Bob -- for parade use only -- I suspect you could still have all the lights on your car -- just not for normal driving. That might depend on the location. Good Luck and post pictures of how it comes out. Use black electrical tape as it won't pull the paint off it does not stick as well as duct tape or masking tape it comes off easy. We had a truckload sale one time and borrowed a nw trailer from Fruhauf to put in our parking lot, we put the signs on with masking tape and it sat in the sun for a week, it cost over $1000. to have the trailer cleaned, this was in 1960 so it will make a mess if left in the sun. Danial, must be up late because you love your T almost as much as your granddaughter, but not quite, and want her to have a great memory this Christmas. Police dont like it when you use red or blue lights on the road. That said, I feel like they would be fine with them if you had them on during the parade. I would just make sure that you turned them off at the end of the parade. I would not be afraid of running red lights on my car. I would just make sure to be courteous to the police and turn them off at the end of the parade. Never know. Sometimes a guy can get away with stuff in a smaller town than he could in a larger town. Let us know how it goes and have a lot of fun. Merry Christmas. Perhaps a dumb question, but why an inverter to run LED lights? LED lights run on DC. Your point is absolutely correct. The reason I would do the Battery-Inverter-LED path is convenience. 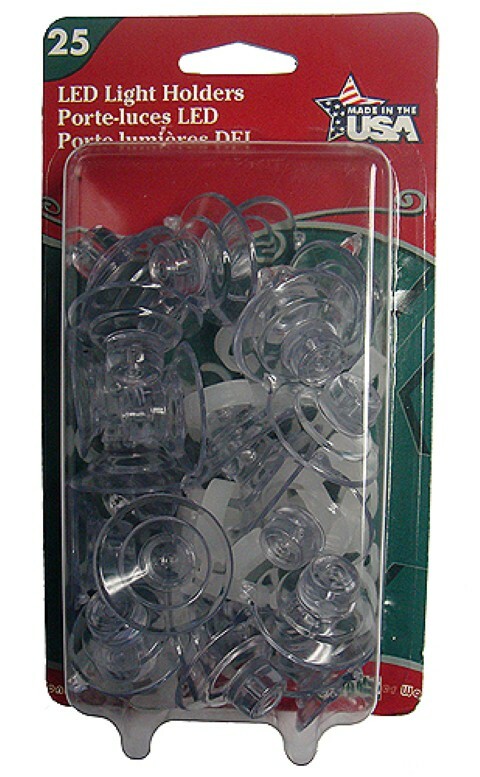 120 VAC LED Christmas light strings are readily available and easy to deal with. Being "Ambition Impaired" (i.e. lazy) I would use the 120 volt LED. I use Christmas light holders like the ones for gutters. These would work even better. Hey Doug, the Christmas light holders are IT. Thanks. Some of the light chains actually runs on 24V AC so why not connect it to the magnet? Just do not rev the engine too high. Or if you don't want to drill the body, weld the hooks on. You're always thinking, Mike. I like that in a neighbor who lives 1000 miles away. Thanks Doc, I'm doing what I can. Holy cow! Nice Christmas decorating idea, but like my daddy always used to say... DON'T TOUCH THE PAINT!! !